(BALTIMORE, MD) - (July 14, 2014) - Re-create your favorite scenes from Heath Ledger's performance as the Joker with the PREVIEWS Exclusive Dark Knight Joker Miracle Action Figure (MAF EX) from MEDICOM Toy! The Joker Miracle Action Figure is available to pre-order from the July issue of PREVIEWS and will be released in comic book specialty shops in late April 2015. 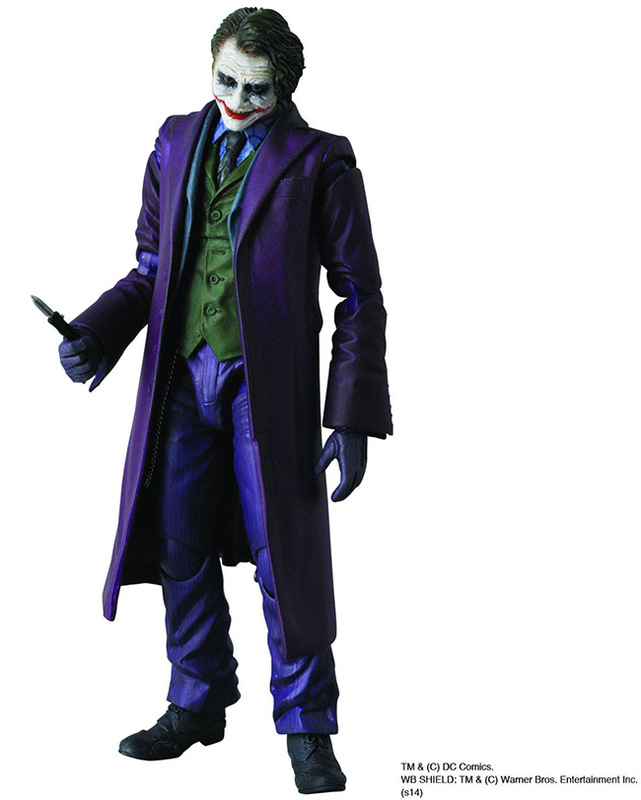 Fans of Batman, the Joker and Heath Ledger's performance in The Dark Knight won't want to miss out on getting their own Dark Night Joker Miracle Action Figure (Item Code: APR148224, SRP: $49.99, Page 500) coming exclusively to comic book specialty shops. Standing just over 6" tall, this chilling reproduction of the sinister criminal includes alternate heads and hands, plus a full arsenal of weapons to recreate many of his signature moments from the film! The JAKKS Pacific Monsuno® toy line continues to grow in 2013 with the addition of all-new collectible transforming action figures. The toy line, which brings the excitement of the Monsuno® boys action adventure series to life, will offer all-new fun, easy-to-learn, action-packed game play that is tightly integrated with Season Two of the Animated Series, Monsuno®: Combat Chaos™ which will premiere on Nicktoons this Spring. Also brand new for 2013 will be a dynamic lineup of accessories, battle sets and much more, allowing kids to fully immerse themselves in the world of Monsuno!